Do you go through cooking fads and fashions? I have to admit that I do. For example, years ago I loved the notion of the "copy cat" recipe. In my student days I couldn't get enough of the "secrets" of making commercial foods. McDonald's special sauce or KFC's coleslaw, anyone? Not surprisingly, it was a short-lived phase. Especially when I worked out that spending lots of time trying to recreate convenience food was in fact quite inconvenient. And that on the whole, homecooking is much nicer. Yet recently I've started to entertain notions of copy-cat cookery again. One of the kids has quite severe allergies to egg and nuts and commercial treats have been off the agenda for a few years. But seriously, how long can one reasonably go without a packet of Arnott's Choc Ripples in the pantry? 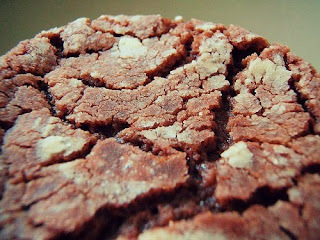 (I've never told anyone, but I have recurring dreams of the iconic Australian freezer dessert, the Choc Ripple cake). 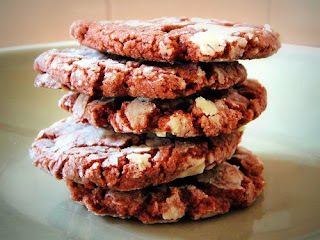 So last week when I chanced upon "Chocolate Lace Crisps" in Chocolate - 70 delicious recipes by The Australian Woman's Weekly I could barely believe my eyes. The canyony surface; the dark chocolatey colour. Mmmmm - clearly a Choc Ripple doppelgänger, if I ever saw one. I went a bit crazy and made two batches only days apart. The second time 5 year old Argy helped out. 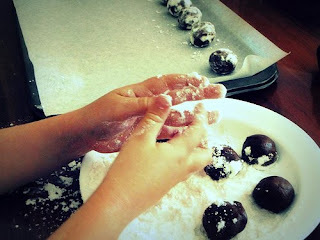 He loved helping roll the cookies and toss them in sugar before placing them on baking trays. I am not so sure about his technique of blowing excess sugar off the cookies. I don't think they would do that at Arnotts. I too love the lace crisp! You could make him a special cooking shower cap and then it really would be like working at Arnotts! Have you tried making a choc ripple cake with them? That will be the ultimate test! Yummmmmm I love choc ripple cake! Oooh delicious! Will have to give those a try - and the girls love making a chocolate ripple cake so thanks! Oooh, I had a choc ripple cake for my 8th birthday, and as you can see it made a huge impact on me. Of course, I had no idea how easy they were to whack together. And you have to crumble a whole Flake over the top. Yummo! Damn - they look good. Now I'm craving chocolate ripple cake! I duped monaco bars (ice cream sandwiches)! We're lacto vego's so I'm always looking for dupes on the net!